Interstate 11 is the designation adopted for the U.S. 93 corridor between Phoenix, Arizona, and Las Vegas, Nevada. Future I-11 corridor signs were posted along U.S. 93 south along the Hoover Dam Bypass freeway, and beyond its split with Interstate 40 east by 2014. The initial portion of Interstate 11 built is the Hoover Dam Bypass, a four mile stretch of freeway traversing the El Dorado Mountains and Colorado River Canyon east of Boulder. Signed currently as U.S, 93, the four lane freeway shifted through traffic away from Hoover Dam onto the nearby Mike O’Callaghan – Pat Tillman Memorial Bridge. The twin-rib concrete arch span opened to traffic on October 19, 2010. Phase 1 of the Boulder City Bypass project extends the RTC portion of the bypass north from U.S. 95 to Railroad Pass, and upgraded a portion of U.S. 93 & 95 northwest to Interstate 515. Costing $83 million, work on the 2.5 mile section broke ground in May 2015 and was completed on January 27, 2018.6 It included a new parclo interchange for Railroad Pass Hotel & Casino, and a south side frontage road leading back to Dawson Avenue in Henderson. The future travel lanes of Interstate 11 ran along the west side of the old U.S. 93 & 95 roadway at Railroad Pass. Southbound U.S. 93 & 95 shifted to the new roadway on August 15, 2017.7 Photo taken 07/21/17. 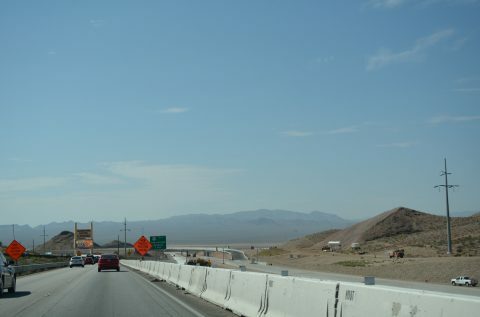 With opening of the southbound lanes of the Boulder City Bypass phase 1 through Railroad Pass, sign changes were made in September 2017 redesignating I-515 south from from Interstate 215 (Bruce Woodbury Beltway) as Interstate 11.5 U.S. 93 and 95 were also realigned onto I-11 following the January 27, 2018 completion of the northbound roadway from the interchange with U.S. 95 to Foothills Drive in Henderson.6 AASHTO approved this on May 29, 2014. Discussion continues from Nevada politicians for the concept of extending the Interstate 11 corridor beyond Las Vegas, and to at least Reno. Benefits to improved freight travel and trade with Mexico are cited as potential benefits. 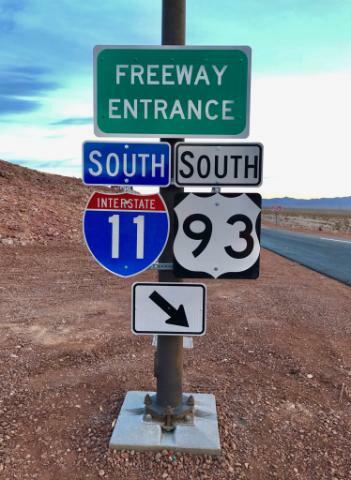 Signs for Interstate 11 were first posted in September 2017. Photo taken by Jeff Royston (01/15/18). Interstate 40 Overlap to Kingman – a new freeway to freeway connection to U.S. 93 north would have to be built to link with the expressway en route to Hoover Dam. Hoover Dam Bypass (Mike O’Callaghan-Pat Tillman Memorial Bridge) – freeway bypass south of Hoover Dam over the Colorado River between Arizona and Nevada near Boulder City. The bridge was under construction in January 2005 and was completed in October 2010. As various freeway proposals took shape across the region, local leaders and businesses realized the absence of complete freeway connection between Phoenix and Las Vegas. Efforts coalesced into a new Interstate highway corridor, which ultimately became Interstate 11.1 This route is also part of High Priority Corridor 26, the larger CANAMEX trade corridor. Interstate 11 will replace I-515 north from Railroad Pass to the exchange with Interstate 215 (Las Vegas Beltway) in Henderson. See the guide for Interstate 215 for photos. The corridor for Interstate 11 through the Phoenix area is not yet finalized. “Asbestos delays work on Boulder City bypass.” Las Vegas Review-Journal, March 10, 2014. “Signs mark proposed freeway linking Vegas, Phoenix.” AZFAMILY.COM, March 21, 2014. “New segment of northbound Interstate 11 set to open.” Las Vegas Sun, January 24, 2018. “Southbound I-11 Lanes Opening in Henderson.” KXNT (Las Vegas, NV), August 9, 2017.